Space shuttle Endeavour is now on display at the California Science Center in Los Angeles. See collectSPACE.com for more photos. LOS ANGELES — Space shuttle Endeavour debuted on public display Tuesday (Oct. 30) at the California Science Center (CSC) in Los Angeles, where thousands turned out and lined up to be among the first to see the retired NASA orbiter inside its new home. "Today, the Endeavour goes on display and the public can experience this landmark and the history of technology and space travel," L.A. Mayor Antonio Villaraigosa said in a ceremony that was staged and sat invited guests under the shuttle. "Visitors from up and down the Golden State, from all across the country, and from the four corners of the Earth will have a chance to share in the Endeavour experience." "This isn't just a ribbon cutting for Endeavour's home, this is a ribbon cutting for the future of L.A.," Villaraigosa said. "We are so proud to be the new stewards of this national treasure," Jeffrey Rudolph, CSC's president, said. "We are thrilled to welcome all of you to join us for this historic occasion, the culmination of space shuttle Endeavour's journey to its new home at the California Science Center and the opening of the Samuel Oschin Pavilion." Displayed horizontally but with its landing gear retracted, Endeavour sits mounted atop the modified NASA overland transporter that was used to bring it to the science center. The transporter, in turn, is positioned on seismic isolation pedestals to protect against the chance of earthquakes. The exhibit is the result of more than a year of planning and an almost month-long delivery process that saw the space shuttle fly into California from Florida atop a NASA jumbo jet in September and then roll through the streets of Los Angeles on a three-day unprecedented road trip earlier this month. NASA awarded Endeavour to the CSC in April 2011. Inside the 70-foot-tall (21 meters) and 150-foot-long (46 meters) pavilion, Endeavour appears to glow under the steel-supported structure's lights. The orbiter is displayed with a Spacehab logistics module — a "float-in" closet" — that it launched to space in 2007 and an example of a real space shuttle main engine (as opposed to the three replica engines that were installed on Endeavour for display). Admission to see Endeavour is free, but due to the high level of interest, the CSC is requiring a timed entry ticket, which carries a $2 service fee. Endeavour is the third of NASA's retired space shuttles to open on display since the shuttle program ended in 2011. Fleet leader Discovery has been on exhibit in northern Virginia at the Steven F. Udvar-Hazy Center, part of the Smithsonian National Air and Space Museum, since April. Enterprise, NASA's first prototype orbiter, opened to the public at the Intrepid Sea, Air and Space Museum in New York City in July. Atlantis, which flew the 135th and final flight of the space shuttle program, will be delivered to the Kennedy Space Center Visitor Complex in Florida on Friday (Nov. 2). It will then open to the public on display in July 2013. Like all of its sister ships, Endeavour was assembled in southern California at aerospace facilities in Downey and Palmdale. The CSC highlights that heritage in "Endeavour: The California Story," an exhibit that visitors enter before seeing the space shuttle itself. "I want to welcome all of you to the opening of Endeavour, which in many ways is a California story," said Mayor Villaraigosa. "Endeavour's story has been a spectacular one, full with unforgettable moments, from its construction in Downey and its assembly in Palmdale, its 25 missions to outer space, its 4,671 orbits around the planet Earth, to Endeavour's iconic flight over California landmarks atop of a 747, and its slow and steady journey through 12 miles of city streets." "Today, we officially say, 'Welcome home, Endeavour.'" Photos and videos showing Endeavour under construction are displayed along a wall inside the gallery, which helps set the stage for visitors as they wait their chance to enter the shuttle's pavilion. "The California Story" also includes a number of artifacts that flew on Endeavour, as well as support equipment that helped launch it on its missions between 1992 and 2011. Endeavour's six tires, on which it touched down after its final mission, STS-134, on June 1, 2011, are on display. Guests are invited to touch the four main landing gear and two nose gear tires, which absorbed the force of the high-velocity landing. Two components removed from inside Endeavour's sealed crew compartment are also on display. Visitors can see the food galley used to prepare and warm the astronauts' freeze-dried meals, as well as the crew's waste collection system, or toilet. The latter helps to answer the popular question, "How do you go to the bathroom in space?" 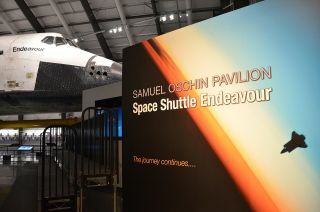 The Samuel Oschin Space Shuttle Display Pavilion, which was named after the late entrepreneur and philanthropist whose family foundation's significant donation to the CSC made the exhibit possible, is intended only as a temporary housing for the orbiter. A scale model of the science center's planned permanent home for the space shuttle, the Samuel Oschin Air and Space Center, shows Endeavour standing vertical with a pair of solid rocket boosters and external fuel tank, as it appeared on the launch pad. Winding walkways and a 200-foot-tall (61 meters) viewing tower will offer visitors the chance to see Endeavour from top to bottom. "Starting today, the Endeavour's new mission is to inspire future generations of scientists, engineers and explorers at the California Science Center. First here in the Samuel Oschin Pavilion, which opens today, and later in its future home, the Samuel Oschin Air and Space Center," Rudolph said. The CSC hopes to open the Oschin Air and Space Center by 2017. To do so, it still needs to raise a large part of the $200 million projected cost. In addition to private gifts such as the one made by the Mr. and Mrs. Samuel Oschin Family Foundation, the CSC is inviting its members and supporters to sponsor one or more of Endeavour's thermal heat shield tiles that line its underbelly. Donations to join the CSC's "Team Endeavour" begin at $1,000.